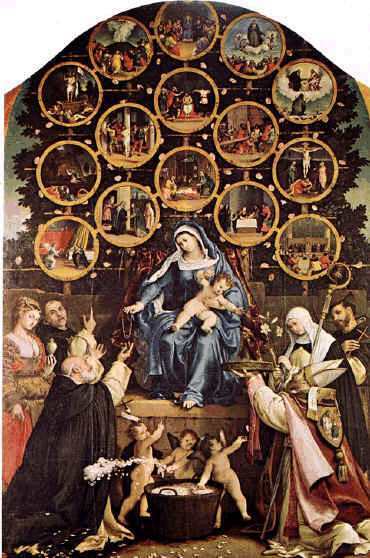 Medieval History of the Rosary :. By the time of St. Dominic (circa 1170-1221 A.D.), the use of the first half of the modern day Hail Mary, the Angelic Salutation, was common as a repeated prayer as well. It was really Blessed Alan de la Roche, the Founder of the Rosary Confraternity,preaching and writing in the latter half of the fifteenth century, who provided the link between the Dominicans and the Rosary. He attributed the devotion to Dominic's vision of Mary, but Blessed Alan was much more devout than he was a careful scholar. Although Blessed Alan de la Roche sincerely believed that these visions of Dominic were revealed to him, other historical corroboration is lacking. Nevertheless, de la Roche was tireless in his work to spread devotion to the Rosary, and in his devotion to Our Lady. The next evolution of the form of the Dominican Rosary was indeed the work of a Dominic, but it was a different Dominic, altogether. Dominic the Prussian, a Carthusian monk of Polish descent, desired to refine and strengthen the Rosary as a means of meditative prayer. He is responsible for separating the group of fifty aves into groups of ten and, more importantly, of uniting each prayer into a meditation on some aspect of the Savior's life, death and resurrection, and that of His mother, the Blessed Virgin Mary. This is crucially important in the development of this marvelous prayer form, for it provides the Rosary's comtemplative dimension, which is its true heart. A true understanding of the comtemplative dimension of the Rosary, the way in which it unites all the faculties in recollection, and thus can serve as a doorway into deeper union with God, would set to rest the fears of those who mistakenly see it as "vain repetition". Rather, it is a prayer that set itself in motion in the interior of the heart and helps us to stay focused on all that is good and holy.